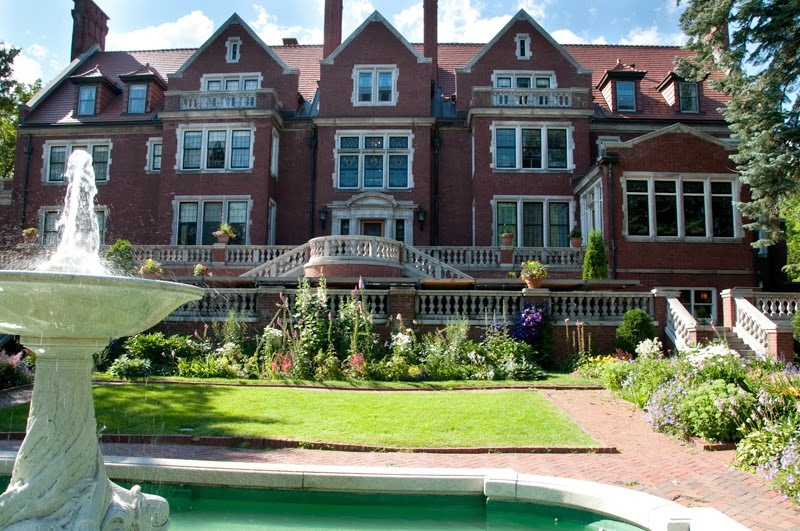 I love historic old mansions that have been turned into museums, and my favorite is the Glensheen Mansion in Duluth. A gorgeous house and beautifully manicured grounds right on the shores of Lake Superior, the story of a New York lawyer who got rich in the local mining industry and built this house for his wife and many children, plus a murder mystery! I have to admit, I am more than little fascinated by the story of how elderly millionaire Elisabeth Congden and her nurse were found dead in 1977, one smothered by a satin pillow and the other beaten to death with a candlestick (an actual candlestick!). Yes it's gruesome and tragic, but it's also one of those "truth is stranger than fiction" stories that is so captivating. Playwright Jeffrey Hatcher and composer Chan Poling have taken this fascination with this weird and wonderful story and turned it into a musical, presented as the third show in the History Theatre's Raw Stages Festival. Or at least it's the beginnings of a musical. After working together for only a few days, the creators and the fabulous cast they have assembled presented just over an hour of material. They had meant to have more, "but it snowed" (Jeffrey is extremely dry and funny, see also his Lifetime Achievement Ivey Award acceptance speech). It's definitely still in the "raw" stage of the development process, but almost every song and scene is terrific, the tone of "ironic comedic cynicism" is spot on, and it has much potential to be a fantastic new original musical (my favorite thing in the world!). In a short intro, Jeffrey explained that the musical is supposed to be a "non-realistic break the fourth wall" sort of thing, with "a spirit of theatricality." Our way into the story is through a modern day tour guide at the mansion (a bubbly Aly Westberg). She calls the head docent (Norah Long) in a panic when one of the guests takes a forbidden photograph in the stairwell where one of the bodies was found. Through a series of flashbacks we meet Elisabeth Congden and her two adopted daughters - Jennifer, the sweet and pretty one (Norah again) and Marjorie (the always fabulous Jody Briskey), who epitomizes the phrase "black sheep of the family." Marjorie meets her second husband Roger (an adorably awkward and "sad sack" Robert O. Berdahl) and introduces him to the family. He (with or without Marjorie's assistance and knowledge) plots to kill Elisabeth, is convicted, confesses to secure his release from jail, and commits suicide. Marjorie is never convicted and goes on to rack up charges of fraud, arson, bigamy, and even murder. The action flashes back and forth between moments in the past and the present day, where we also meet a "cub reporter" (Randy Schmeling) and a wacky detective (Jim Ramlet). The only part of the piece that didn't quite work for me was the ending, with a long exchange about the camera or phone used to take the picture. I was confused about who this woman was (Marjorie? the ghost of Elisabeth? ), and the reveal that she was some sort of Marjorie fanatic didn't quite seem to fit. I only nitpick because the rest of the show is gold, just waiting to be polished and fleshed out and put together in the most shiny way possible. The wonderful songs with clever and funny lyrics include the Sweeney Todd-esque "Ballad of Haunted Glensheen," a song between the two sisters, one good and one bad, a Marjorie/Roger duet - a "mismatch made in hell," a very funny and drunken Roger singing about the "murder plot," Marjorie's swan song "Burn it Down," and what seemed to be the favorite of the audience - nurse Velma's* sad and sweet song in which her husband begs "stay with me" when the recently retired nurse is called back to work that fateful night. I loved this piece so much. It's my favorite of the Raw Stages festival so far even though it's also the most raw. It's exactly the kind of musical I like - funny, satirical, witty, a little wacky, about a topic I'm already fascinated by. I cannot wait to see it further fleshed out and produced with lavish sets and costumes and a full orchestra. I hope they keep every one of these seven cast-members who were just perfect in their roles, maybe adding a few more actors to fill out some of the roles. Judging by the sold-out crowd, there is definitely an audience anxious to see Glensheen: The Musical, myself included! 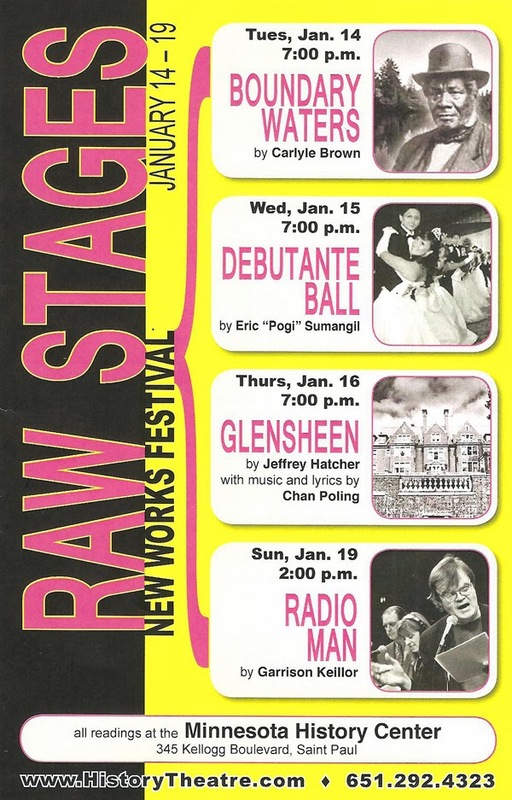 The History Theatre's Raw Stages Festival concludes with a new play by Garrison Keillor this Sunday. But if you don't already have tickets, you're out of luck - it's sold out. But don't worry, I'll be there and will tell you all about it! *Velma's grand-niece was in the audience and gave her approval of the show in general and Velma's song in particular. Do we think this play is appropriate for children ages 8-10? only if you let them watch Criminal Minds unsupervised. Saw the show at the History theater tonight. It was wonderful.